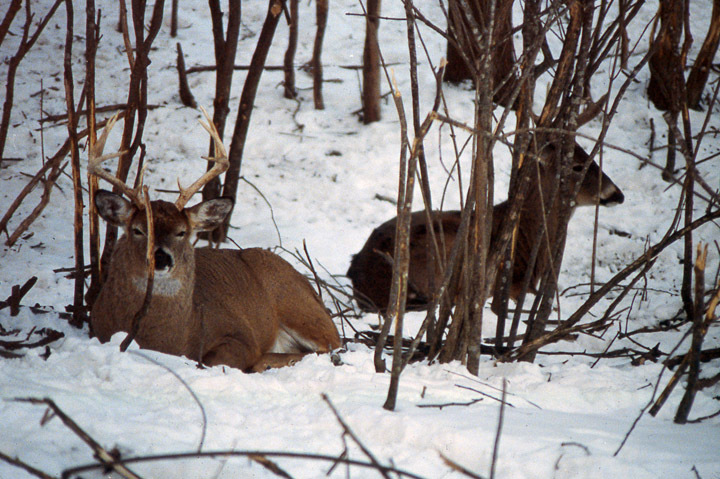 Whitetail bucks bedding in snow. 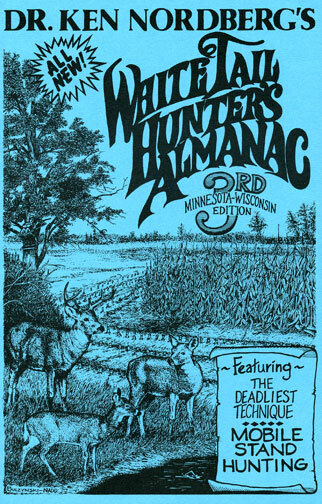 During most firearm hunting seasons in the past decade or so, Minnesota deer hunters have harvested near record numbers of whitetails, often despite a lack of snow. That’s good. 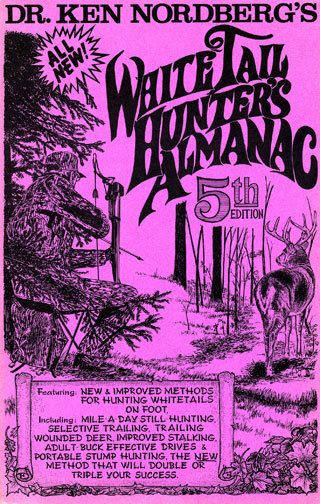 Our whitetails would have been in desperate straights by now due to serious problems evolving from overpopulation. If we don’t have snow for the opener, nonetheless, almost every hunter complains about it. “We sure could use some tracking snow,” is a common lament. 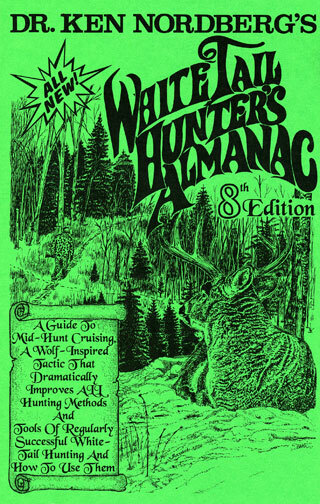 In our camp the most heard complaint is, “Without snow it sure is hard to figure where the big bucks are located.” To make matters worse, commonly coupled with a lack of snow is a persistent south wind and unusually warm temperatures, putting a damper on whitetail activities during daytime hours. Wearing fur that keeps them warm in extreme cold, whitetails logically limit movements to cooler nighttime hours, especially during periods of moonlight, clouds or no clouds. Yet like many other hunters, despite a lack of snow my sons and I usually manage to tag our customary three or four mature bucks each season. Evidence of two bucks battling is easy to spot in snow. When a blanket of snow covers the ground, buck hunting certainly is easier. The key, then, is fresh tracks (sharp edged) of a walking, adult-buck-sized deer (tracks five to six inches long from tip to dewclaw), especially if these tracks accompany fresh tracks of a doe-sized deer (four to 4-1/2 inches in length, tip through dewclaw) during November’s primary breeding phase of the rut. 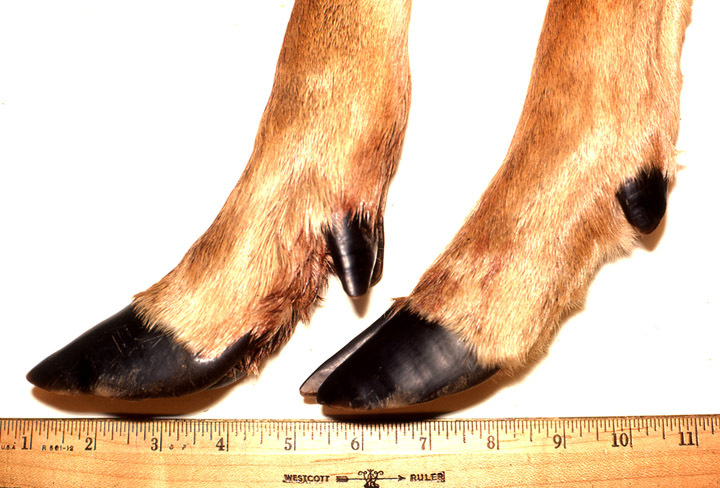 The front & back hooves of a mature buck. While smelling the irresistible aroma of the pheromone released into the air via the urine of a doe in estrus, antlered bucks commonly walk stiff-legged, dragging their hoofs from track to track. 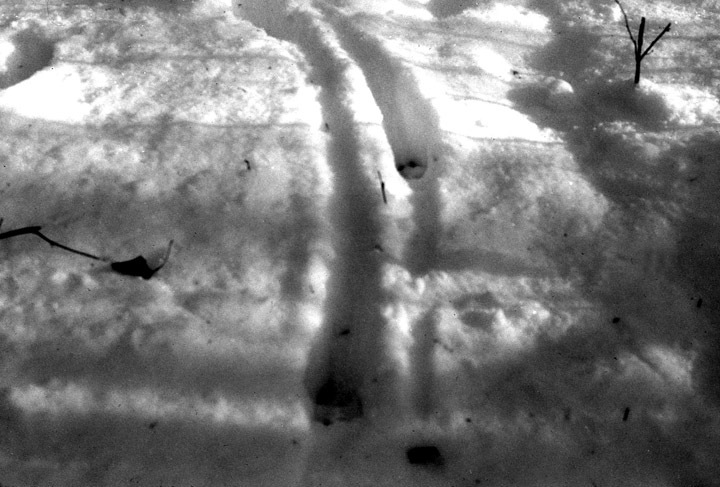 Mature buck tracks in snow. 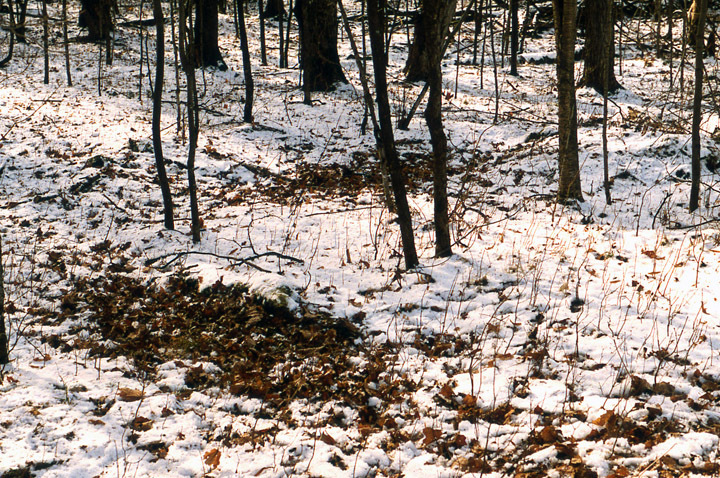 When under the influence of a doe's estrus scent, a buck will drag its feet, leaving a very distinctive track pattern. A discovery of such tracks, especially if six inches in length, are an exciting find in our camp. Whether the tracks accompany the tracks of a doe or not, the bucks that made those tracks will almost always be with a doe in estrus in the nearest current favorite whitetail feeding area later that day or the next morning (does are only in estrus 24-26 hours). During the first week of hour Minnesota firearm hunting season, our whitetails feed on green, thin-bladed grasses or acorns and then switch to browse at the beginning of the second week in November. Our browse is stems of woody shrubs such as red osier and mountain maple and/or stems of tree saplings such as sugar maple. 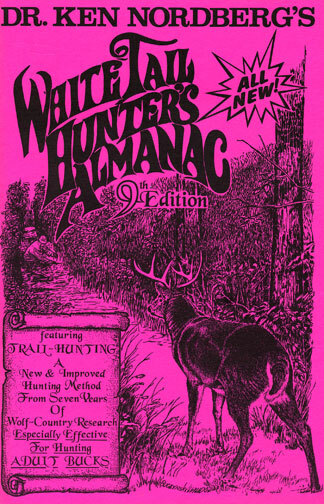 The hunters who discover such tracks either heads alone to an appropriate feeding area that afternoon, approaching from crosswind and sitting (on a stool) at a vantage point on a crosswind perimeter to reduce odds of being scented by deer approaching from downwind, or the hunter heads to a downwind perimeter the next morning so deer already feeding there (they arrive two hours before first light) cannot smell the hunter. Quite often (with great success) we set up a small, group hunt upon discovering such tracks. 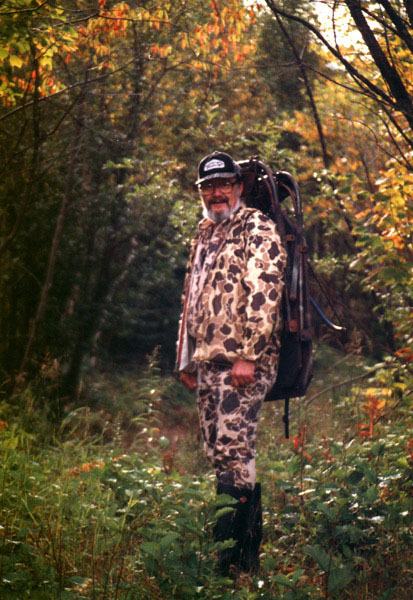 To make feeding deer move toward one or two unscented downwind hunters, 15-30 minutes after stealthy hunters reach their downwind stand sites undetected, one or two other hunters head to hidden upwind sites and sit down. Their scent streams downwind throughout a pie-shaped area nearly 400 yards wide, 200 yards downwind. Very soon, the feeding downwind deer will determine via airborne scent (and a lack of sounds) that one or both upwind hunters are no longer moving, therefore nothing to worry about as long as the deer do not move in their direction. They will thus begin feeding toward the undetected downwind hunters, eventually becoming visible within effective shooting range. 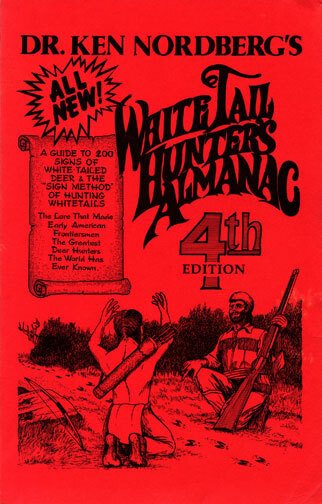 Attempting to aggressively drive an experienced adult buck toward one or more downwind hunters rarely works. Our non-aggressive approach (we call it “the gentle nudge”), using human scent drifting downwind from stationary sites to influence the direction a buck (and other deer) will move often works. My son, Ken, has three bucks on the wall that were taken while using this hunting method. When hunting after the primary breeding phase of the rut has ended (it usually ends by November 17), though we continue to hunt feeding areas early and late in the day (where very fresh tracks and droppings of older bucks are found), we begin to hunt buck bedding areas midday as well, sites identified via fresh and old tracks, droppings and beds (beds 45–53 inches in length). We always approach bedding areas from crosswind and sit at well-hidden sites crosswind. When no snow covers the ground during one of our hunting seasons, fresh and shiny droppings become our almost-exclusive key to success. At this time under such conditions, it's valid to assume fresh droppings 3/4 to 1-3/8 inches long are those of a dominant buck currently accompanying a doe in estrus. Upon discovering such signs, therefore, we quickly begin hunting the nearest feeding area. 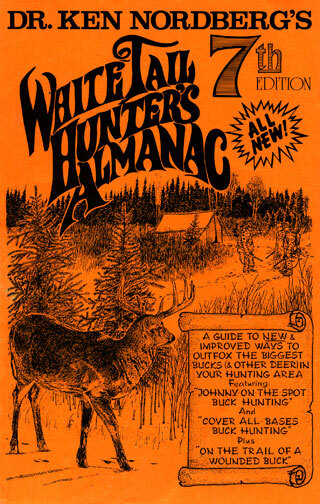 This is a well-proven strategy for maximizing odds of spotting adult bucks and other deer.